No longer just for backwoods cabins and rural villages, the composting toilet helps us turn what we normally consider a distasteful waste into a valuable resource - while also breaking the cycle of polluting precious fresh water to flush the material out of sight. Join us in this three day skill-building workshop as we study ecological human waste management and build an innovative composting toilet system for the Art Farm Visitor Village. The instructor will go over the do’s and don’ts of creating a safe and effective "Humanure" system including site selection, containment, design options and system maintenance. 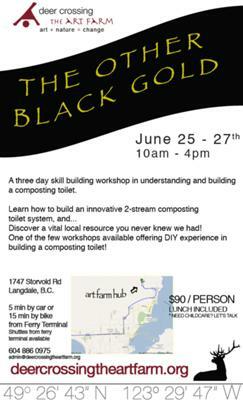 One of the few workshops available offering DIY experience in building a composting toilet! Limited camping sites available for $10/ night for off-coast visitors.